Habitat: Desert, Upland, Mountain. This wildflower grows in grassy areas. 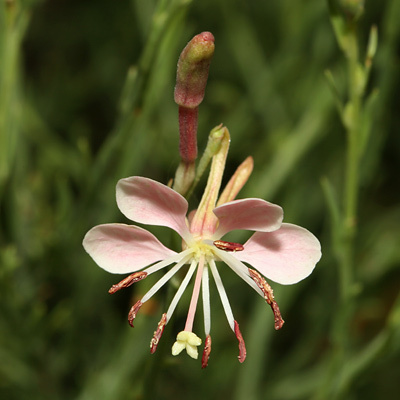 Description: The flowers are 1/2 inch (1.3 cm) wide and have 4 asymmetrical, spoon-shaped petals, a 4-lobed stigma, and 8 stamens. 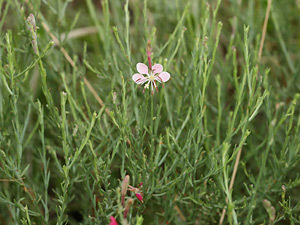 The flowers open white in the evening, later turn pink and then reddish and finally close later the next day. The leaves are small, alternate, and linear to narrowly elliptical in shape with smooth or toothed edges. Butterfly Plant – The white, newly opened, nocturnal flowers attract pollinating moths. Fragrant – The flowers are lightly fragrant in the evening.